It's September. September 4th, actually. Already. Can you believe it? Today is the first official day of school for most kids. I don't have kids, yet, so when September rolls around the only thing that it means to me is more traffic on the road and cooler weather. But for most people, it means classes, schedules, school supplies, and homework. And with homework comes a need for a great space to get it done. When I was growing up, I had a desk with a hutch attached to it. You know the type that I'm talking about? It did the trick - I was able to get my work done. But, although the desk served it's purpose, it was far too narrow. It had lots of storage space in the drawers and in the hutch cubbies, but it lacked desktop space for doing homework, and eventually (when I was in university) a computer monitor, keyboard, and mouse. So, with back-to-school in full swing, it got me thinking about beautiful (and useful) desks that any student (or blogger) would be able to use. This desk is fit for a king (or queen). I don't think anyone would complain with this much table top space. It's ideal for working on large projects or even crafting. I also love the bookshelves - lots of room for books, storage boxes, and artwork. I've seen bulletin boards before. Heck, I have one hanging over my desk now. But, I have never seen a bulletin board quite like this - it's a full wall of inspiration! The long desktop also allows for two people to work at the same time - ideal for kids that share a bedroom. Ok, so I realize that this next desk might not be your typical student desk, but like I mentioned earlier, some of these desks are ideal for bloggers or others who work from home. First things first, the wallpaper is awesome! 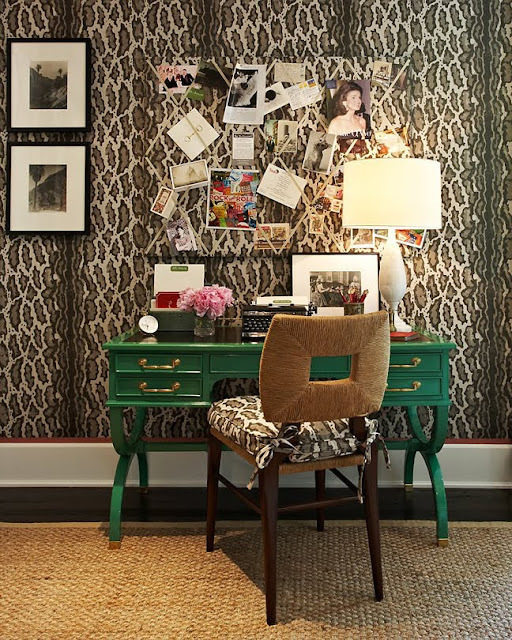 I love that they also make the bulletin board out of the same wallpaper so it looks like the pegged photos and papers are floating in a cloud of animal print. What's also great with this space is the colour of the desk - the emerald green and brass hardware brings a luxuriousness to an otherwise functional space. I really appreciate the simplicity with this deskscape. The focus on black, white, and gold really livens up the natural wood tones of the desk. Not to mention that this desk is large enough for two people to work at the same time. And the gallery wall provides an artistic side to a strictly work area. 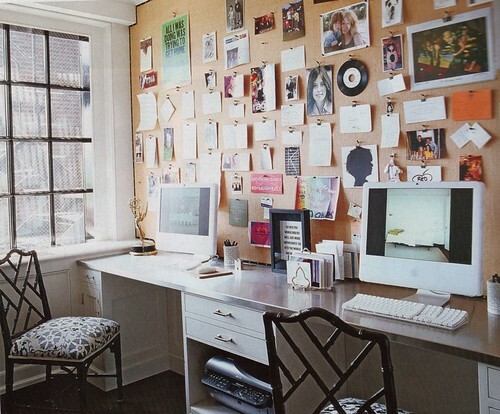 This desk and office area is chic, elegant, and simple. It is light, bright, and airy - the perfect balance for a quite Sunday afternoon blogging, err, ... or working :) I also love desks placed in front of windows - it brings the outside in and makes it feel less like work. I've mentioned before that my home office is very much a work-in-progress, so these great "deskscapes" have me itching to get that room done quickly. (psst... remember to send me your interior decor questions so I can reply to them in an upcoming post. Thanks! ).